The Canadian Museum of Flight is hoping a new site will allow it to display more of its collection of vintage and restored aircraft. 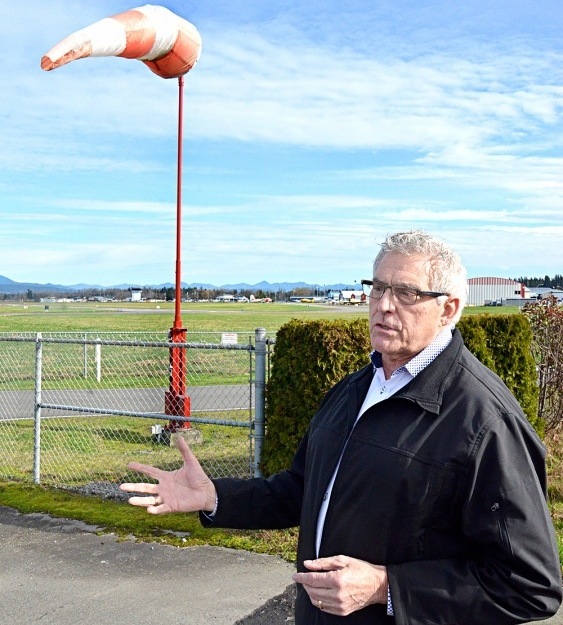 On Monday, Township council was asked to support an application to the Agricultural Land Commission, asking the ALC to allow non-farm use of a section of municipal land just to the west of the Langley Regional Airport. If the use is approved, the museum would have a 1.6 acre site on which to build a new facility, a hangar and display area. “We’re so overcrowded right now,” said museum manager Terry Brunner. The museum’s small leased hangar is packed to the brim with artifacts, including restored and vintage aircraft, uniforms and medals, models, and engines. Many of the items were donated over the years, and several of the aircraft have been loving restored and made flight-worthy by teams of volunteers. “We can’t add anything new to the collection, because we don’t have any room to grow,” said Brunner. The museum has two storage sites full of items it can’t bring out. The current hangar has 650 square meters of space, and there are several aircraft, including a rare Handley Page Hampden bomber of Second World War vintage, parked outside. The lack of space also limits restoration efforts. The new potential site is part of the 51-acre Derek Doubleday Arboretum, on floodplain land to the west of the airport. The new site is 45 per cent larger than the current museum footprint, and could accommodate a larger building. The site is the far southeastern corner of the arboretum, up against the airport and separated from most of the rest of the park site by a creek. “We still would have access for our flying aircraft to get out to the runway,” said Gord Wintrup, who is heading up the museum’s building committee. If successful, two years from now the museum could be housed in a 15,000 square foot concrete building, with another 5,000 square feet of mezzanine space. That would replace the 5,000 square feet the museum currently has, and much more of the collection could be moved indoors. The preliminary estimates from two builders are that the structure would cost a little more than $2 million, said Wintrup. The land would be almost free – leased from the Township for $1 a year. With the reduced leasing costs, commitments from lenders, building suppliers, and even a $50,000 donation from Air Cadets Squadron 746, the museum should be able to move forward, said Wintrup. The building will benefit the Air Cadets as well, Wintrup noted. The museum hopes to provide a permanent meeting place and home for the cadets in the new building. The Arboretum and Botanical Society of Langley has written a letter in support of the project, saying it will complement the arboretum. Access would be by a right-in/right-out driveway off Fraser Highway. 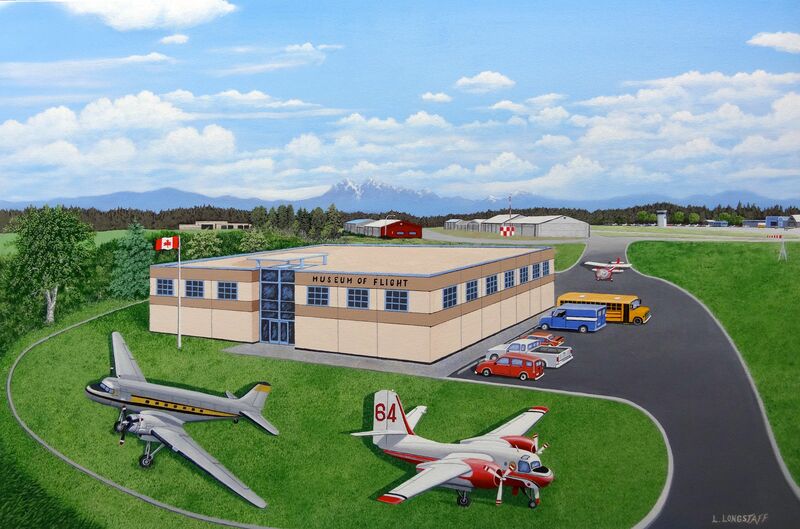 Artist’s concept of a new home for the Candian Museum of Flight at Langley Airport. Painting by Birthplace of B.C. Gallery artist, Lyle Longstaff. This entry was posted in Barbados Day, Birthplace of B.C. Gallery, Community Volunteers Make a Difference, Gallery Artists in the news, Historic Trust. Bookmark the permalink.